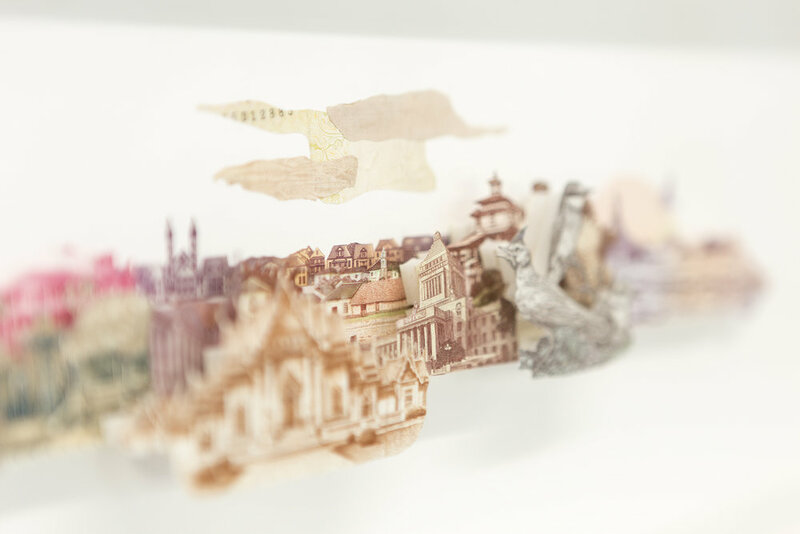 Rodrigo transforms bank notes from around the world, creating colourful collages that highlight the original design of each note while creating his own landscapes. He works with camouflage as an essential concept, creating the doubt of what is the original and what has been altered. Rodrigo studied Painting in School of Fine Arts – UFRJ and Photography at Ateliê da Imagem in Rio de Janeiro. studied photography at Ateliê da Imagem - Rio de Janeiro in 2010. From 2006 until 2010 worked as assistant of the painter Luiz Zerbini, at 2010 studied in Parque Lage – Rio de Janeiro in a Advanced Course for beginner artists. During 2014, participated in the Creative Process Workshop, by Charles Watson in Parque Lage. Currently he is represented by A Gentil Carioca where he had his first solo show in 2009 “Defeito”. He won the Itamaraty Prize of Contemporary Art 2013 and the Acquisition Prize- 16° art salon UNAMA of small formats. Among the exhibitions he has participated are his 2009 solo show at A Gentil Carioca and the group shows: “Arquivo Geral” (Centro Carioca de Design/RJ, 2010); “Sobre Ilhas e Pontes” (Cândido Portinari Gallery/ UERJ, 2010). “12° salão de Itajaí” (Pavilhão Centreventos/SC, 2010); “16° salão UNAMA de pequenos formatos”, acquisition award (Belém / PA, 2010). “Prêmio Diário Contemporâneo de Fotografia” (museu UFPA / Belém, 2010). O elogio da vertigem. Maison européenne de la photographie (Paris, França/ 2012). Um convite à viagem – Rumos Artes Visuais 2011-2013, Paço Imperial, Rio de Janeiro, Brasil. (2013); Constructedotherness, Latin America Art Show, London (2016). Rodrigo Torres. Uns trocados (Spare Change), 2014. Collage, 22 x 46 cm.